It has a faster processor and supports Apple Pencil. If you are planning to buy the newest iPad released by Apple, you should be ready to see a very familiar gadget. Yes, it’s a familiar iPad with a hand full of nice upgrades. The iPad was revealed two months back in March by Apple at a remarkable event in Chicago. The new iPad unveils the idea of helping schools more in the teaching methodologies but how? That’s vague. We can have fun with the new companion because of its fast processor and its support with the Apple pencil accompanied by exceptional accuracy. You can draw and doodle, something that your predecessors missed paying the same price for their iPads in 2017. The new iPad cost $329 which is almost the same as the last year’s model, as we mentioned earlier. However, 128GB and LTE variants cost more in addition to paying for a $99 for Apple pencil. It feels like Apple has missed the deal when you compare the iPad with its primary competitors like Chromebook, but for average customers, this is a cherry on the cake. They can get a top-notch branded tablet for as less as this price. End of the day, they’ll be paying for a premium gadget that comes in competition with the ultra-budget Amazon Fire tablets which are of course out of the reach of many. The screen of the new iPad remains as gorgeous as always. Although being without the fancy screen upgrades of iPad Pro, one will enjoy the world full of iOS applications. The Apple pencil support added for scrolling is chock-full of everything you need. With Apple pencil and maybe a keyboard along, you’ll reach the level of a midrange Windows laptop. 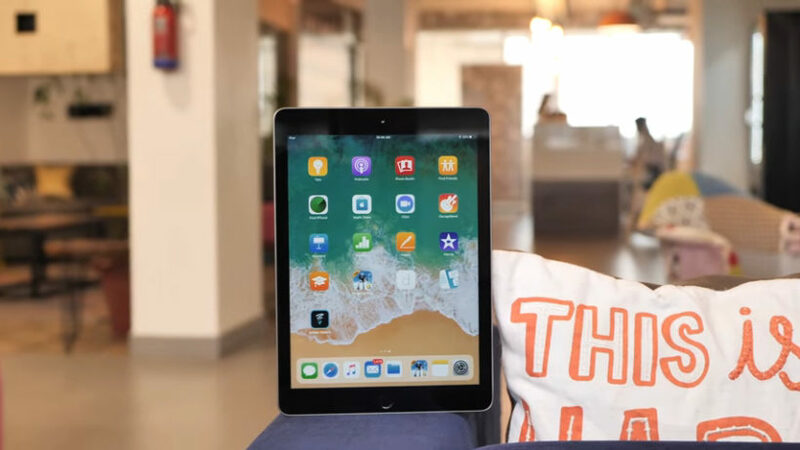 As a baseline, you should know that you’ll be getting the bulk of amazing features only at a fraction of price of the price of iPad’s step-up siblings. Those who paid $500 for old iPads may regret the idea now because the new iPad runs circles around the older versions. So, yeah, this iPad isn’t terribly exciting. But, it’s also pretty great. Speed and Apple pencil, the only difference from 2017? As we’ve mentioned before, the news that the new iPad can work with a stylus is a good one for the creative work lovers and doodlers. 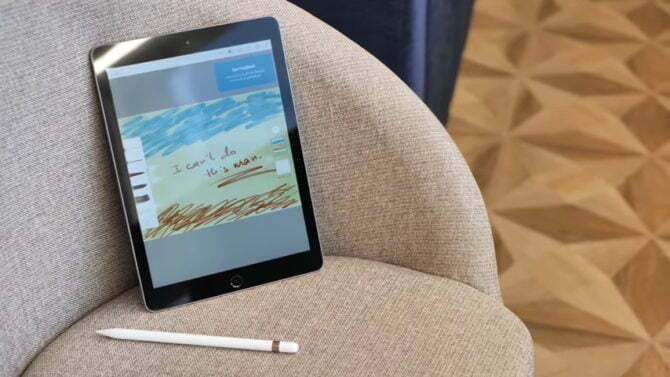 Not any different than the other stylus like Microsoft’s Surface pen, the Apple Pencil is very sensitive to pressure and makes you take a merry-go-round while using art apps and the built-in Notes and Pages applications. Not everyone has to spend money on the Apple pencil because your finger will do a good job for you for basic pdf annotations and instant writing. However, you can add the expense later if need be. iPad of 2017 performed exceptional in terms of speed and scrolling but yes, one won’t deny that it was a new processor embedded in the body of an old iPad. The new model solves this problem. Although iPads didn’t change a lot in their outlook and design over the years the new once thus seems catchier. For many of us, the difference is hard to spot may be. 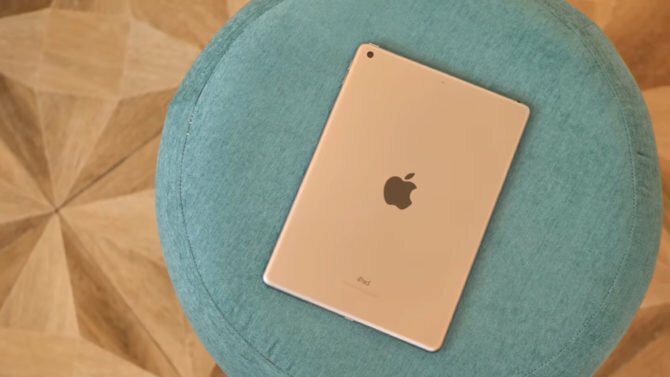 The iPad 2018 has a fast processor of A10 and it beats almost every iPhone except the models of iPhone 8, iPhone 8 plus and iPhone X. For a device just being priced at $329, this is a great remark. The screen sizes 9.7 inches and has improved internal features. One will realize after using the iPad for a couple of days that it is more than speed and the stylus. The iPad is a convenient usage option and operates swiftly when it comes to app loading and gaming standards. Its performance is praiseworthy even by iPad standards, as the benchmark indicated in our tests. The iPad has the first generation button that works fine for touch ID. The speed is greatly improved for LTE usage. What’s more to add to good? Significantly better than the Microsoft Surface Pro, the iPad has an excellent battery which lasted for 12 hours and 44 minutes in the three video streaming playback tests. This is more than what Apple claimed. Apple stated that the battery life for all current iPads is no lesser than 10 hours. If we go about the iPad Pro, that works even better and lasts even longer. So we now know that a better processor and an Apple pencil are not the only good things. Although these are the major deviations from last year’s iPads. So those of us who are a stylus fan, they may feel free to upgrade to the new iPad and the rest can do well with the previous models may be. The sleek and slim iPad, that costs half the price of the iPad Pro 2017, is an exciting gadget to bag but don’t expect a completely new companion to add to your desk. It just a make-uped 2017 iPad.